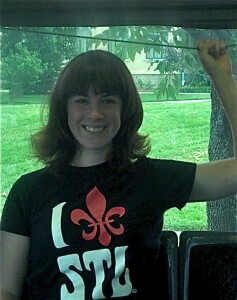 Good to remind myself that I'm part of a larger transit-riding, STL-loving community. Every year, I resolve to have New Year resolutions. But like many of my fellow well-intentioned human beings, too often I find the “resolve” part of resolutions ending in a mixture of guilt, frustration and general negligence. Resolutions are easy to make, but even easier to break as we creep through January and our daily routines come sneaking up from behind the holiday parties and empty gift boxes. But January also has a restorative effect, a sentiment of renewal that I hate to ignore. I want to resolve to do something. It feels as much of a part of my winter routine as taking down the stockings and dumping the last of the eggnog down the drain. Some people join gyms, cut back on sweets, and vow to put a few more dollars in their savings accounts. And I bet I’m not the only one out there who resolved to take more multimodal transportation. But we all could use some helpful tools and motivation to support it in St. Louis. As my friends and colleagues know, I like to take the bus and train. I enjoy riding my bike. But like many people in our region, living in an environment geared toward automobiles, parking spaces and highways, sometimes it seems easier to find your way via car (if you have that option – sometimes, we don’t). Or, it is easy to get stuck in a comfortable commuting routine, and not taking the time to explore other options, routes and modes. It does take extra planning. It can take extra time. But I believe strongly in the benefits of public transit, both for myself and the community, as do many others in St. Louis. Yesterday, Forbes Magazine contributor Margie Warrell wrote about seven tips to help keep New Year’s resolutions the entire year, and I think it speaks well for anyone who strives to take multimodal transportation, not just when it is easy and convenient, but as part of our regular routines. How can we encourage each other to use multimodal transportation? How can we keep incorporating it into our lives? In Part One, I’ll take a look at Warrell’s suggestions and break it down for the resolved multimodal transportation user in St. Louis, including myself. 1. Connect to core values. Warrell, first and foremost, suggests making the connection between what we resolve to do and our inner values. For me, this was a pretty easy jump. I believe in diverse neighborhoods where people can live, work and play. I believe in protecting and conserving the environment. I believe in making sustainable use of our choices in infrastructure and development. I believe in living a healthy, active lifestyle, and surrounding myself with my neighbors. So when it’s freezing cold outside and I have to wait for the bus, I will imagine these core values in action, and my part in it. 2. Be specific. Here is where many resolutions live or die, in the details. It’s easy to say you want to lose weight, make more healthful choices, or save money, but it is more difficult to make the consistent choices that sustain that lifestyle change. Warrell suggests writing down specific goals, and tracking your progress. If you want to lose weight, set a time frame and a target goal, and mark your progress each day, through calories, exercise and weight. To encourage more multimodal transportation, set a time frame and specific actions you can take. For example, set a goal to take transit to work 2 days a week, and bike to work once a week. Or 5 times in a month, leave the car at home and take the bus or walk. Make specific goals that allow you some room to experiment, allow for emergencies, and let you establish a more comfortable routine. If you say you want to take transit more often, it doesn’t mean you should never use your car. Instead, set manageable goals to incorporate into your traveling habits. For me, I want to start riding my bike to work (or in conjunction with transit) once every two weeks during cooler months. 3. Design a supportive environment. When it comes to keeping resolutions that involve a change in personal habits, a supportive environment is key. Other people can provide the motivation and resources necessary to keep you going, and to reaffirm your values. Think you won’t make a difference by taking public transit or walking? There are a lot of people out there who think otherwise. There are more out there. Twitter feeds, Facebook friends, forum moderators, coworkers, teachers, personal trainers, and more who can give you the support you need just by talking with people. When I moved back to St. Louis and embraced transit, I was amazed at how many people I met who had that one thing in common with me, and it helped to find others. Tomorrow, in Part Two I’ll talk about the rest of Warrell’s tips for successful resolutions and how they apply to multimodal transportation in St. Louis. Well said, Courtney! You have inspired me! Great Job Courtney! I really enjoyed reading this and found it helpful and inspirational too.